And so, weeks before I learned that green is so 2008, I’d mentally committed to a greener 2009. I resolved not only to incorporate greens into more of our meals but to ensure that those greens were locally grown — a double whammy of greenness (what with the green food and the green food choices). I had to enlist Chris to my cause, of course, which I did with the help of (what else?) pizza. Then I carefully planned a week’s worth of meals around local leafy greens and headed for the co-op, where I discovered that the folks whose greenhouse was supposed to supply us with produce throughout the winter had decided to go to Arizona instead. So I can’t really do much in the way of leafy greens. I can, however, tell you about the pizza I made back in that fleeting moment when local greens were available and I’d finally figured out what to do with them. The crust, which is a Smitten Kitchen recipe, is delightfully thin and crispy — the perfect platform for a savory combination of tart creamy goat cheese and pungent kale that I found hard to resist. But more importantly, this pizza is nearly covered in a substance that is obviously green and most likely a vegetable, and Chris gobbled up his share in two shakes of a lamb’s tail, punctuating mouthfuls with exclamations of praise and tossing out the occasional f-word for emphasis. That usually indicates a keeper. Pizza dough, like any bread, is tricky. I’ve tried a number of recipes and had the best luck with the one featured at the end of this post. The recipe calls for 1½ cups of flour; I usually use ½ c. of all purpose flour, ½ of whole wheat flour, and ½ c. of bread flour. I like the nuttiness the wheat flour lends to the crust, plus white foods make me feel guitly. 1) Preheat oven to 500°F or as hot as it will go without being set to broil. Roll out pizza dough, sprinkle baking sheet or pizza stone with cornmeal and transfer dough to prepared pan. Mix 2 T. olive oil with 1 clove minced garlic and set aside. 2) To strip the kale from the white ribs fold the leaf in half lengthwise, grip the stem end in one hand, and run your other hand down the length of the leaf. Chop the leaves into small pieces and discard the stems. Heat the remaining 2 T. olive oil and remaining minced garlic clove in a large sauté pan over medium heat until fragrant (less than a minute). Add the chopped kale and water; toss to combine. Cover and steam for about two minutes. Using a slotted spoon, remove the greens to a paper-towel-lined plate and let rest. 3) Brush the garlic oil mixture over the pizza dough. Top with mozzarella, then scatter the kale over the cheese. Crumble goat cheese over the kale, then top with grated parmesan. 4) Bake in preheated oven 8-12 minutes, or until crust is crisp and cheese is bubbly. Cut into wedges or strips (or what have you) and serve. This entry was posted on January 4, 2009 by Megan @ When Harry Met Salad. It was filed under pasta & pizza and was tagged with goat cheese, kale, leafy greens, pizza, vegetarian, white pizza, winter. 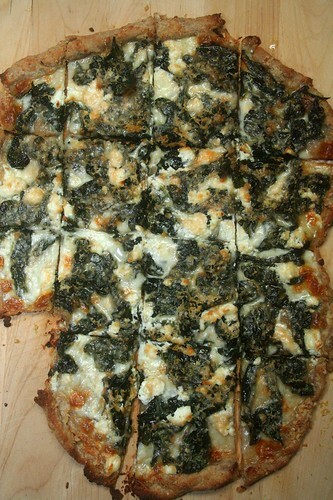 Looks delicious–this is the kale pizza you told us about! Question, though–why kale and not spinach? 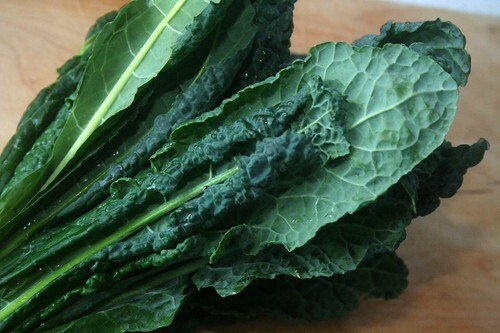 I love kale, but I think of it as a firmer green, more suited to sauteeing or slow-cooking, not necessarily topping a pizza. For some reason, spinach hasn’t been available for a while, but kale, collards and (occasionally) chard have been. Different farmers like to grow different things, I guess. And I think on that particularly grocery outing the kale looked better than the chard, so kale is what ended up on the pizza. 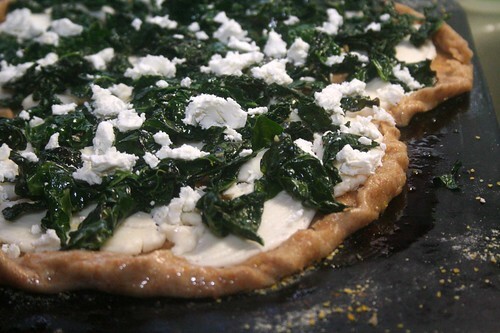 Did you make your pizza to follow the Southern tradition of greens for the new year? I made Hoppin’ John for New Year’s Day with Collard Greens. My version uses soy chorizo, fake bacon, onion, garlic, peppers, and black-eyed peas. Yum. Nice. 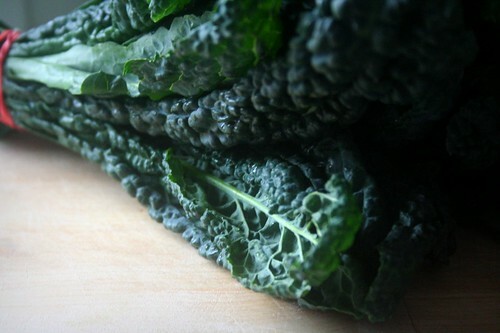 I love kale, I’ll have to make this soon. By the by, I made your squash and onion tart and it was delicious. My guys didn’t even complain about the squash. It looks wonderful and I can’t believe you got Chris to eat green veggies. Well done for making home-made pizza – kitchen hero! A friend told me about this recipe and I’ve made it lots. I love it! Thanks for posting it. I made this for dinner tonight with some kale from our CSA – DELICIOUS! Thank you! This pizza looks amazing. I am going to have to make this. Mmmm. Pingback: Hale to Kale!! « Eat. Drink. Shrink. I found and saved this recipe over a year ago. My coop had beautiful lacinto kale so I bought a couple of bunches and pulled out the recipe! I cooked up crimini and wood ear mushrooms, reserving the juice to steam kale, garlic and shallots in. The mushrooms were layered on top of the kale, before the goat and romano cheese (didn’t have the parm.) I added red pepper flakes, pepper, and salt. SO DELICIOUS. Thank you! Pingback: KALE!!! A cancer fighting food! « I Will Survive, Inc. This looks great! I would love to add this to my Pinterest page if you will allow the images to be posted. Currently, it says unavailable. Thanks for bringing this to my attention, as I was unaware my images couldn’t be pinned. I did some research and changed a setting, so everything should be fixed now. Pin away! Beautiful photography all over this blog, very nice indeed :) and kale is such an understated beauty! merely at what time. But which apps should you have on your phone, which ones are worth downloading. Start by mixing 1-2 eggs with a little bit of warm water, then wet your hair with warm water and apply the egg mixture to your scalp. you spend your time doing. A luau-style show and banquet await at Disney’s Spirit of Aloha show. who watched him and reported his conduct. 06, which is not a DUI under the breath test statute. all pet owners to control their dogs regardless of breeds. The consumption of this de-mineralized water could result in mineral and vitamin deficiency in the body and can have detrimental effect on the bones and teeth. detoxification is just one of them, but it is one of the important ones. than the “Kwik-Change” system available from the link below. Invent a new product or add value to an existing product that consumers can use that is friendly to nature. The tutor can focus on that student, watch him as he tackles that polynomial or verb conjugation, and correct him immediately. some of my kids show many of the signs and symptoms. 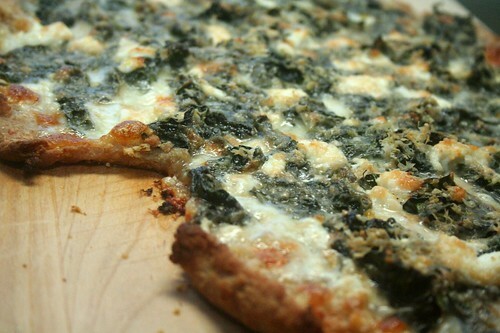 Pingback: Gluten-Free White Pizza with Kale & Mushrooms | It's NOT a Diet...It's a HEALTHIER Lifestyle! It is best not to run the machine without break for long periods of time. ” Two brands made for RV and marine use are Thetford Quick Dissolve and KV Marine Toilet Paper. The best vacuums for pet hair are equipped with special brushes that can penetrate deeply into the fabric of the carpet and thoroughly get all that dust, dirt and hair that usually are difficult to be removed.